What are the best shoes for boxing? This is a great question we get asked all the time. And the answer is really up to preference. But, yea, you can for sure. Let’s look into this. You can use wrestling shoes to box, but you can’t use boxing shoes to wrestle. Boxing shoes are designed for traction going forward and back, hence the grip is usually a checkered pattern. Wrestling shoes are designed to have traction going in all directions, hence they usually have circular patterns. However the amount of grip is where they differ. I use my Asic Matflex wrestling shoes to box in and they work fine. 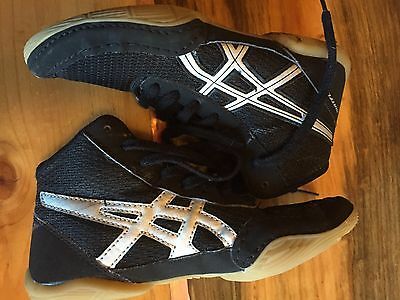 Wrestling shoes offer the most traction through out the whole sole, boxing shoes offer traction maininly on the ball and heel, and allow you to easily slide your feet. In conclusion, boxing shoes offer more support with a stiffer sole, and many shoes have a good ankle wrap; it’s perfectly acceptable to wear wrestling shoes for boxing, there are some professionals that box on HBO who wear wrestling shoes. So it really is up to the user and there preference in fighting style. Hear is the top selling wrestling shoe model, Matflex, on Amazon.